"the thirty-eight herbs heal gently and surely, and as there are no poisonous plants amongst them there is no fear of ill effects from overdoses or incorrect prescriptions." 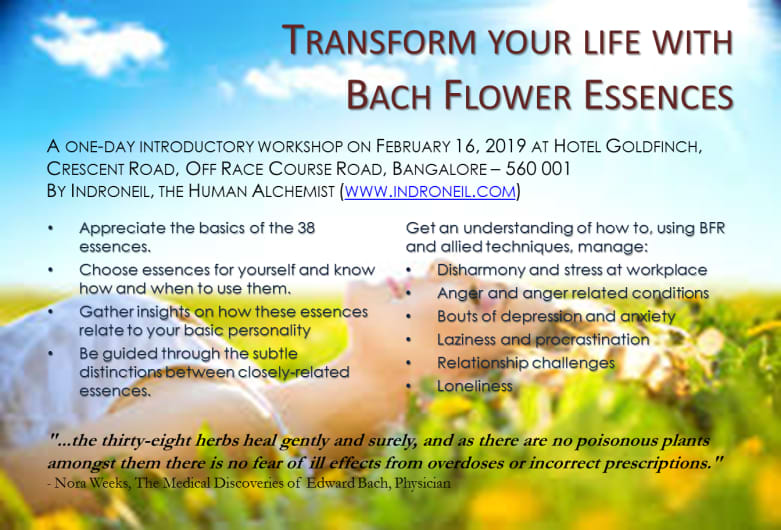 Bach Flower Essences offer a safe and natural method of healing discovered by Dr. Edward Bach from 1920 – 1930’s in England. They gently restore the balance between mind and body by casting out negative emotions such as fear, sadness, hatred, envy and anger which interfere with the equilibrium of the being as a whole. The Bach Flower Remedies allow love, joy and peace to return to the sufferer so that the body is free to heal itself. Bach Flower Essences are made from wild flowers and are safe for the whole family including pets. To appreciate the basics of each of the 38 essences and the philosophy of self-help. You will start to choose essences for yourself and know how and when to use them. and get to lead a much more purposeful, love-led, positive and prosperous life. 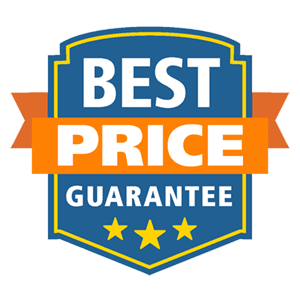 Indroneil, acclaimed as a Guru of Change and one of the Top Ten Thinkers of the country is an avid enthusiast, student and practitioner of Bach flower essences discovered by Dr. Edward Bach. Over the two decades of his journey as a Transformational Enabler and Human Alchemist, he has touched and transformed lives of more than 10,000 individuals. In the last one decade of his practice he has included Bach Flower composites in his eclectic approach to enabling transformation. I was going through a severe depression. I just wanted to be left alone. I did not go out at all. Stepping out of the house was scary for me. I just did not have the energy to do anything. My work and home both suffered massively. Indroneil gave me a 3 month course of a composite of different Bach flower essences. I could see changes in my behavior. I slowly started to feel like myself. My fear of going out reduced and I have started enjoying company of people. It has been a transforming experience for me. Now I am absolutely open and energized with a clear mind. I find meaningfulness in my work and family. Bach flower remedies work like magic. I have been suffering from severe depression and anxiety after my husband’s demise. I lost all my money and property, which aggravated my anxiety. I have been taking anti-depressants for 4 years and could not live without them. Indroneil gave me a composite which I have been taking for the past 5 months. In the first month, I took both the Bach flower composite and my anti-depressants. Gradually, I completely stopped taking anti-depressants. Now this medication keeps me grounded and my fears have significantly subsided. I also have an SOS medicine which helps me with sudden attacks that may be triggered. INR 5900/- per person to be fully paid in in advance. This includes cost of certification, toolkit, lunch, and tea / coffee / snacks. NOTE: Those registering before January 31, 2019 will get a free kit of oft used essences.